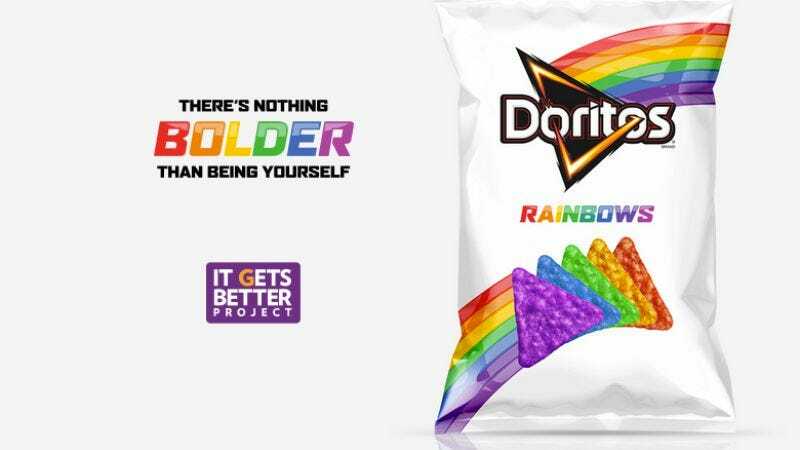 In conjunction with the It Gets Better Project, Doritos recently released limited-edition rainbow colored Cool Ranch Doritos. The chips aren’t available in stores but instead are gifted to anyone who makes a $10 or more donation to the organization, which supports LGBT youth who grow up in unsupportive environments. But since some people can’t agree that helping out kids who are being bullied is a good thing, they took to the official Doritos Facebook page to express their frustration. So Mike Melgaard, the man behind a similar Target prank this August, made an account called “Doritos ForHelp” and took it upon himself to reply to these angry Doritos fans as if he were the official company. While it’s admittedly not the most original prank, it’s still satisfying to see bigots put in their place. Some of the best replies are below and Melgaard has a whole collection up on his Facebook page.